The only thing that I find annoying about Skype is the call function. Most people who I get into calls with mostly ignore the push-to-talk (totally not blaming them since it isn't mapped to anything at default) that it doesn't mention unless you search through the options. Also I hate Skype because it forced me to update to this oh-god-2-smartphone-4-me version but I'm just being bias. Starting a group wouldn't be bad (or useless), it would be less stressful talking to people there without playing VSP (or any game) and start bitching how I was hit three meters away by a hale. Might as well, I'll blind you all with my looks! I should introduce myself, since I never done one before. Hiya! My name is Sunny Daze aka World's Greatest Pervert (No one hasn't challenge me so I'm keeping that title.) on Steam. You can just call me Pervert though since no one never says my name in whole. I recently found out about this group two days ago and wonder why haven't I find this sooner, the Versus Ponyville server is awesome! Even though I don't play TF2 alot, it's really fun playing you people. I don't know what else to say so I'll just end this. 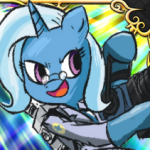 Oh yeah I forgot, Trixie best pony.